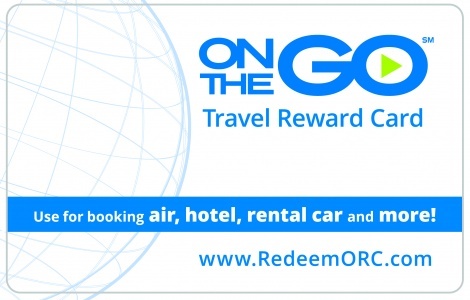 The ONtheGO Travel Reward Card is the first corporate gift card that can be used to book any combination of air, hotel, and rail, and has no expiration date. Booking travel is quick and easy with its consumer-friendly booking website. With the reward card, the traveler has access to savings on a wide range of airfares and hotels. The ONtheGO Travel Reward Card is an amazing way to recognize employee or team efforts, thank company suppliers, award a winning prize at a company event, and more! They can easily set up their ONtheGO account and start redeeming their hotel and travel rewards online. Additional reservations can be made (e.g. rental car), but the reward card balance cannot be used for these other types of reservations. Give your employees the gift of travel today! National Gift Card is the best place to order your Orbitz ONtheGO Travel Reward Cards in bulk. Gift and rewards cards are our specialties, and we are always willing to help you set up your gift card solutions program today. If you would like more information about Orbitz ONtheGO’s bulk, direct-to-recipient, or individual gift card fulfillment for your gift card program, head to our contact page or call us at 888-472-8747. As you redeem your On-the-Go Travel Reward Card(s) and utilize travel arrangements provided by Orbitz for Business you agree to abide by the terms or conditions of Orbitz for Business or its third-party Travel Service Providers. Any redemption or purchase of services provided by Orbitz for Business or its third-party Travel Service Providers, whether that Travel Service Provider is selected by you or by Orbitz for Business or BreakAway, is governed by the rules and restrictions of Orbitz for Business or their respective Travel Service Provider(s). You understand that any violation of Orbitz for Business or its Travel Service Providers’ conditions of purchase may result in cancellation of your reservation(s) or purchase(s), in your being denied access to any flights, hotels, or automobiles, in your forfeiting any monies paid for such reservation(s) or purchase(s), and BreakAway debiting your account or your personal credit card registered on the Site for any costs BreakAway incurs as a result of such violation. You shall be completely responsible for all charges, fees, duties, taxes, and assessments arising out of the use of this Site.